A clutch is an essential part of any vehicle with a manual transmission. But you may not know that many automatic transmissions also have a clutch, even though it is not directly controlled by the driver. The clutch is comprised of two metal plates that separate when the clutch pedal is pushed, essentially disconnecting the power from the transmission to allow for gear change. The Mini Cooper clutch is a complex system that requires a trained expert to repair. Soft or Spongy Clutch: Also known as a loose clutch, or loose shifting, this is the first indication that you have a worn clutch. Burning Smell: If your clutch is malfunctioning, you will often smell a burning smell coming from the engine. This is caused by excessive friction. Hard Shifting: If you are having trouble getting the car in gear, or if it takes a while to shift, this is a good indication of a failing clutch. Visible Wear and Tear: A bit of black powder is common around a clutch. But, if you can actually see visible wear and tear like cracks and grooves, then it’s time for a new clutch. As always, it is better to prevent a problem before it occurs. This will save a lot of money on the cost to repair. 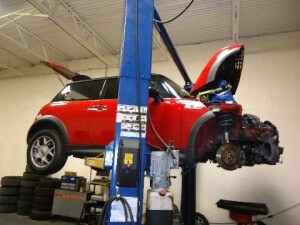 To prevent clutch problems, adhere to the factory-recommended maintenance schedule for the Mini Cooper. This way, the transmission, clutch and transmission fluids will be regularly changed and checked. When transmission fluid turns black, it can cause problems in the clutch. Changing this fluid is part of the maintenance schedule. One of the most common repair procedures that German Car Depot undertakes is repairing or replacing the clutch. It’s no easy feat, however: it involves disconnecting the battery, removing the front bumper, sub-frame and axles, and then removing the transmission in order to gain access. As such, it’s vital that only a specialist should carry out the repairs so that no further damage is caused, especially to other components within the Mini. At German Car Depot, the cost to repair is less than that of a Dealership. If your clutch does need repairing, you won’t be charged dealership prices for either parts or labour, while still receiving the same quality of service and professionalism. All technicians at German Car Depot are trained to the highest industry level, giving you peace of mind that your Mini is in safe hands without breaking the bank.